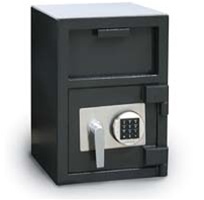 Depository Safe - The SentrySafe Depository Safe is a "must have" for security conscious business managers. It's uniquely designed to protect cash, receipts, deposit slips, keys and other valuables against theft and burglaries at the point of purchase. Ideal for convenient stores, restaurants, bars, hotels/motels, small cash businesses, pawn shops, independent store fronts and not-for-profit operations. The SentrySafe Depository Safe is the smart way to protect your retail business, your employees and your customers. Ship Weight: 95 lb. 43.1 kg.